fastest Germans held their ground among the front fields of the different classes during turbulent races – Daniel Stell even raced to an impressive victory at the exciting German Shifterkart Championship. conditions and caused lots of conversation topics. Driving for DS Kartsport, Luca Voncken started as a Mach1 Factory supported driver. Among the top-class field of the German Junior Kart Championship the youngster immediately showed an impressive performance. The Mach1 driver was the best German driver by ending up eighth at qualifying. On the interim rankings, Luca fell back to 32nd place due to a falling out, but fought his way forward to 19th place during the second race due to great maneuvers. David Liwinski proved his skills at the seniors of the DKM. As 16th of qualifying of the 47-drivers-strong field of participants, the Dutchman made himself known. During the heats, the young driver drove among the front third of the field too and started into the final races highly ambitiously. After 18th place at the first ranked race, the Mach1 protégé gave his all once again and raced forward to tenth place. Team mate Tim Tröger unfortunately was less lucky. After a rough accident during warm-up on Sunday morning he had to forfeit prematurely. 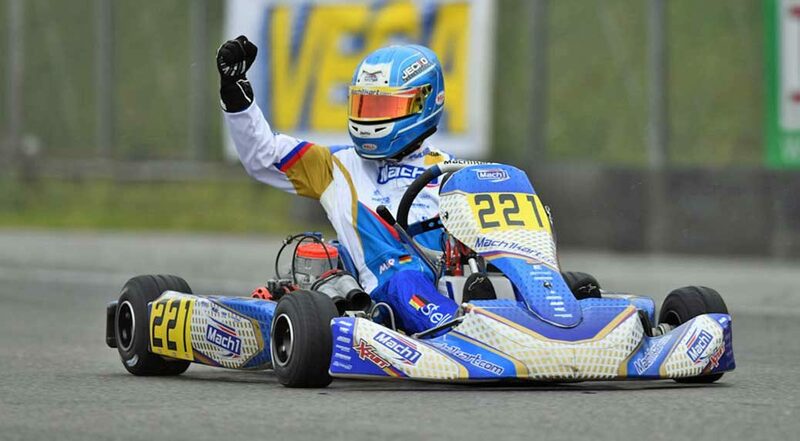 Pawel Myszkier proved himself at the DMSB Shifterkart Cup. After being ninth at qualifying, the Pole improved his performance during the heats even more and secured third place of the interim rankings after two second places. The routine driver defended the same positions during the races as well and caused a lot of joy in the team tent with a double cup success. Marcel Schultheiß and Tim Schröder showed great performances as well. Marcel fought his way forward through the field after a retained qualifying and finally ended up among the ten best drivers of the class on ninth place at the end of the second race. Tim initially impressed at the heats on 12th and 13th places, but lost a little speed during the races and came in on 24th and 22nd positions. Daniel Stell showed a phenomenal performance at the German Shifterkart Championship. The ambitious racer proved his goals with the third fastest time of qualifying. During the heats and also with 10th position at the first race, Daniel was always eye to eye with the highest international competition. At the second ranked race, a true spectacle then followed. After a race interruption due to heavy rain, Daniel was one of the few drivers who decided to restart with rain tires. From then on the Mach1 driver took the lead – but had his hands full during dry phases as well as recurrent rain. In the end he kept the upper hand and raced to his first DSKM victory with a considerable advance. Mach1 Motorsport is already going to go back to the race track in two weeks. From April 28th-29th the ranked races three and four of the ADAC Kart Masters are going to take place in Wackersdorf.